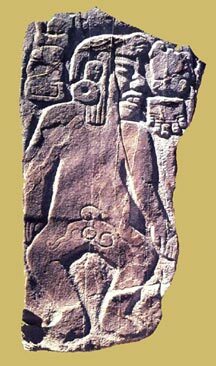 The Classic period was characterized by the emergence of urban state societies throughout Mesoamerica. The foremost was Teotihuacán. Boasting a population of over 100,000 inhabitants, it was one of the largest cities in the world between A.D. 200-700. The Zapotec citadel of Monte Albán rose to dominate much of the present state of Oaxaca. Enduring civic-ceremonial centers like Tikal, Calakmul, Palenque, Copán and scores of other powerful lowland Maya city-states, evolved from precocious PreClassic communities located deep in the heart of Guatemalas Petén jungle. By A.D. 300, monuments with hieroglyphic texts describing divine origins illustrate the transformation of social organization from chiefdoms to institutionalized kingship. Then by A.D. 900, most of the great centers had been abandoned, some after experiencing continuous growth for over a millenia. There are many theories postulated to explain societal collapse, but no single factor tells the whole story. Most ideas focus on the fundamental instability of Classic elite socio-political organizations compounded by environmental degradation; climatic changes and the depletion of resources due to overpopulation. Some areas witnessed a brief florescence of secondary-states between A.D. 800-1200 - an era sometimes called the Epi-Classic. Ceremonial centers such as Uxmal, Xochicalco, Cacaxtla, and El Tajín were renowned for their outstanding artistic developments in intricate mosaic stone facades and fresco painting. During the PostClassic period, regional governments became highly segmented and commercially oriented. Emphasis was placed on the development of great houses, networks of enclosed rooms and courts ideally suited not only to royal feasts that were an integral part of long distance alliance formation, but also to the proliferation of an unequaled level of art and craft production. It was at this time that competition for access into elite exchange networks became so pronounced that traders and craftspeople were driven to seek out the rarest and most exotic materials to maximize the value of their gifts. The technology for smelting gold, silver, and copper, was introduced from Central and South America, while turquoise mined in the American southwest was exchanged for the plumage of Scarlet Macaws. 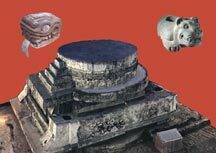 Never before had the Mesoamerican economy been exposed to so many rare materials from such far away places. After the fall of Tula, a Toltec city-state that dominated Central México from the ninth to the thirteenth centuries, Aztec peoples moved south to Lake Texcoco. Eventually they were able to affect the balance of power in the region to such a degree that they were granted royal marriages with venerable Toltec families. By 1450, the Méxica, now the most powerful of seven original Aztec groups, incorporated their former rivals and together they conquered an empire. Eventually, they gave their name to the nation of México, while their city of Tenochtitlán became what we know as México City today. San Lorenzo Head #6. 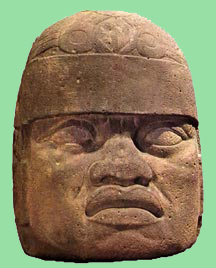 Olmec portraits are the first expressions in art of the emerging systems of social stratification that would characterize Mesoamerican civilization. Click on Image for more detail. 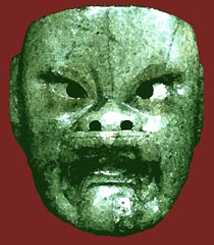 Watercolor impression of an Olmec jade mask carved as the face of a human transforming into a jaguar. Objects of jade and other precious stone served as early forms of chiefly wealth but also displayed the intimate connection between paramount leaders and the supernatural. Click on Image for more detail. Carved stone slabs depict mutilated captives at Monte Albán; the earliest testament to the role that warfare played in the rise of Mesoamerican states. Click on Image for more detail. Religious ritual at Teotihuacán focused on the great Avenue of the Dead, a 145 foot wide processional boulevard that bisected the city. To the left towers the 200 foot high (65 meters) Pyramid of the Sun. Click on Image for more detail. 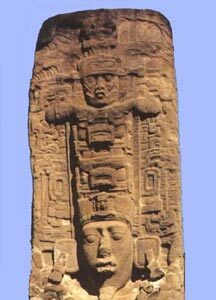 Quiriguá Stela E is typical of Maya monuments that emphasize the institution of divine kingship over the glorification of individual personality. Symbols displayed in lavish ritual dress signify the generations of royal ancestors and gods from whom this lord claimed descent. Click on Image for more detail. 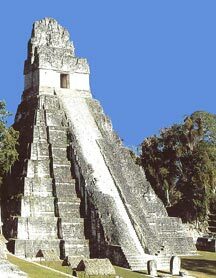 Temple 1 at Tikal was dedicated to the admiration of a ruler whose elaborate tomb was found within the center of the base of the structure. Click on Image for more detail. 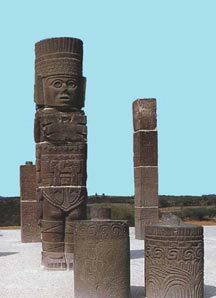 Warrior columns at Tula, Hidalgo. Tula ultimately established itself as an early PostClassic inheritor of social and religious institutions first established at Teotihuacán. Click on Image for more detail. The Zapotec-Mixtec palaces of Mitla were adorned with intricate mosaics of stone work. The Late PostClassic era throughout southern México was characterized by an emphasis on palaces as centers of administrative and ritual activity. Click on Image for more detail. An Aztec temple and stone monuments discovered in excavations at Tenochtitlán, the Aztec imperial capital known today as México City. Click on Image for more detail.